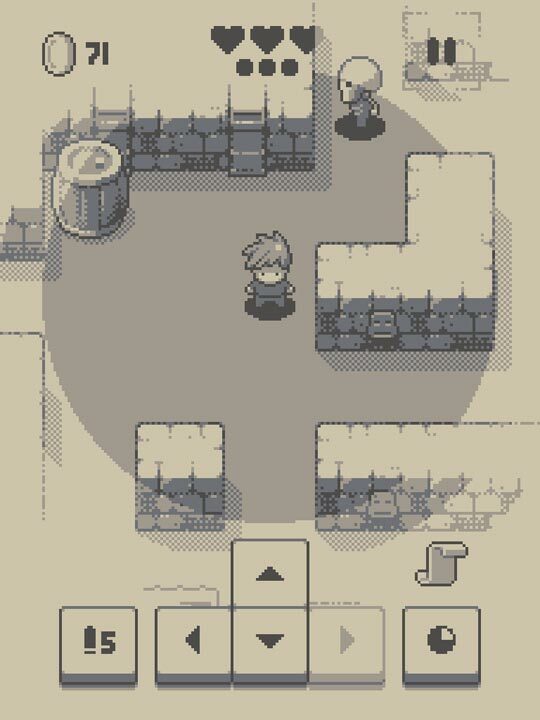 Happymagenta's free-to-play iOS title Into the Dim is a retro-dungeon crawling, roguelike, turn-based RPG game, much akin to MicRogue, and is the story of a boy and his dog. You follow your dog into a series of dungeons, and need to find a key, then get to the exit for each floor. Into the Dim takes both the musical and the graphical nature straight from the brickish original Nintendo Game Boy's grayscale color scheme, albeit with 16 bit graphics, and rounding out the vintage experience here is the wonderful chiptune score. The game's controls use the turn based situation nicely. Players begin with three hearts for health, three steps to move and 5 bullets for ranged attacks, though each of these numbers can be expanded through collecting coins and spending at the in-game store, through watching ads, or through IAPs. The game does feel a bit stacked to funneling people to the IAPs because of the need to use coins to refill health in addition to extending it. That put a damper on my overall enjoyment in just knowing that fact. Players make their moves first then all the enemies go. Because the dungeons are all preset, failure means you can plan farther in advance. Using bullets sparingly or avoiding enemies completely is much easier if you've gone through the level a couple times, and it also offers a chance to find hidden rooms you may have missed. The puzzles themselves aren't too tough, and it maintains a pretty casual difficulty all the way through the game. Though learning that enemies can slaughter you quickly is a painful early lesson in not wasting resources. Extending the life of the game a little is the fact there's an extra endless mode, some competitive leaderboards, and a slew of achievements. The controls work well, they're smooth and responsive. There is a problem with them, however, and that is they are quite poorly placed. The movement buttons are centered which feels odd, and the ranged attack is on the left, while the skip move button is on the right. It makes me curious as to why they didn't put the moves on the left and the ranged on the right, with a skip towards the center. In the end Into the Dim is a decent rogue-like puzzler, with great retro graphics, music, and sound. It might not keep you interested for weeks, but it'll offer a solid amount of short-burst entertainment. If you haven't played it yet, I'd say give it a chance, it'll be a nostalgia fueled way to eat up some time.